An unthinkable tragedy struck Humboldt when a bus crash killed 16 members of the Broncos junior hockey team. As the small city recovers, it doesn’t want to be defined by the crash; it wants to be defined by how its heartbroken community responds. The night before the accident, Leroy and Shirley Haugan had their son and his family over for dinner. Shirley laid out chicken wings, turkey, ham and salad, while her two grandchildren, 12-year-old Carson and 9-year-old Jackson, scooted around the living room, oblivious to the NHL game playing on TV. Leroy asked his only son, Darcy, for a minute on the couch. He’s still not sure why he felt so compelled to speak to him. Maybe it’s because their season was almost over. Darcy was the coach of the local Saskatchewan Junior Hockey League team, and his Humboldt Broncos trailed 3–1 in a playoff series, after losing a heartbreaker in triple overtime at home less than 24 hours earlier. Leroy knew the Broncos were headed back to Nipawin on a bus on Friday afternoon, with Game 5 set to take place that night. Maybe he wanted to wish Darcy luck. Maybe, he would later surmise, it was fate. The Haugans are a hockey family, same as all their neighbors, same as all their friends. Darcy’s parents raised him and his sister, Deborah, in Peace River, Alberta, a tiny town 300 miles north of Edmonton. Leroy taught them to skate as soon as they could walk. He played hockey until age 67, earning the nickname Crazy Legs for the way he barreled down the ice. The vertical scar on his right eyebrow, courtesy of a wayward stick, was proof of how much the game meant to him. He loved God, his family and the Detroit Red Wings, in that order. His son wore so many holes in his Red Wings jersey that it came to resemble Swiss cheese, kept a life-sized cutout of Oilers-era Wayne Gretzky in his bedroom and steadily climbed the ranks of Canada’s junior leagues. He earned a college scholarship to Northern Michigan but left after one season, transferring to a university closer to home. Then Darcy went to Sweden to play professionally, only to crack several vertebrae in his back. That’s when he became a coach, and in 2003, he returned to Peace River. He shared an office with his father at the Kal Tire store Leroy managed, while guiding the North Peace Navigators, the local youth team, to 326 wins. Then in 2015 the Humboldt Broncos called. They needed a coach, and they offered a bigger league, Junior A instead of Junior B, and a full-time coaching gig. Darcy was hesitant to leave his parents, but Leroy retired and decided to move to Humboldt with Shirley, too. Darcy’s wife, Christina, became the team’s office manager; Leroy their biggest fan. The Broncos left that Friday, April 6, shortly after lunch, their bus carrying 29 passengers, the rows filled with players, coaches, broadcasters and support staff. Haugan sat up front. The flat, vast, snow globe expanse of Saskatchewan unfolded out of the windows as the team chugged north. The boys passed the roughly 125 miles to Nipawin the same way they always did, by watching movies like Happy Gilmore, playing poker and cracking jokes. At about 5 p.m., the charter bus was traveling north on Highway 35. The team was almost to Nipawin and approaching an intersection the locals refer to as Armley Corner. Had the boys looked closely, they might have seen the white, wooden crosses staked into the ground to remember the family of six that was killed right there in a 1997 collision. As the bus drove through the intersection, a tractor-trailer carrying dozens of packages of peat moss and heading west on Highway 335 didn’t see them, or didn’t stop, or couldn’t stop in time. The Broncos’ bus flipped sideways, skidding diagonally across the intersection. The roof ripped off, and the front half detached from the back. Bodies were flung from the bus—and under it—while screams pierced through the country silence. First responders, all volunteers from local towns like Nipawin who by day were mechanics and businesswomen and teachers, arrived quickly, and they started pulling passengers from underneath the bus. Using their triage system, they began to place tags near patients, using green and yellow markers for those likely to survive the crash, red tags for those in critical condition and black ones for the deceased. As the tags accumulated, the scope of the damage became unspeakably, unbearably clear. Almost every marker was red or black. On that Friday night, 15 souls on the Broncos bus—10 players, two coaches, the driver, the play-by-play announcer and the statistician—died. The deceased included Jaxon Joseph, the 20-year-old son of the former NHL player, Chris Joseph; and Logan Schatz, the 20-year-old team captain; and their beloved coach, Darcy Haugan. The other 14 passengers were injured. Three helicopters and four air ambulance planes, on loan from various cities and companies, transported the most critically wounded to Royal University Hospital in Saskatoon, almost 170 miles away. The hospital declared a Code Orange, which meant mass casualties were en route. Back in Humboldt, Leroy Haugan received the call that every parent dreads. “Darcy didn’t make it,” Brandow told him. So Leroy called his daughter, whose own husband had nearly died in a car accident eight years earlier, his injuries so extreme he had spent 76 days in the hospital and needed 29 screws and three plates and years of physical therapy to overcome a traumatic brain injury. Why, she wondered, had her husband survived such a horrific crash but not her brother? “I’m not praying,” he responded. That’s when Carson put his arm around his grandfather. “Poppa, I’ll pray,” he said. 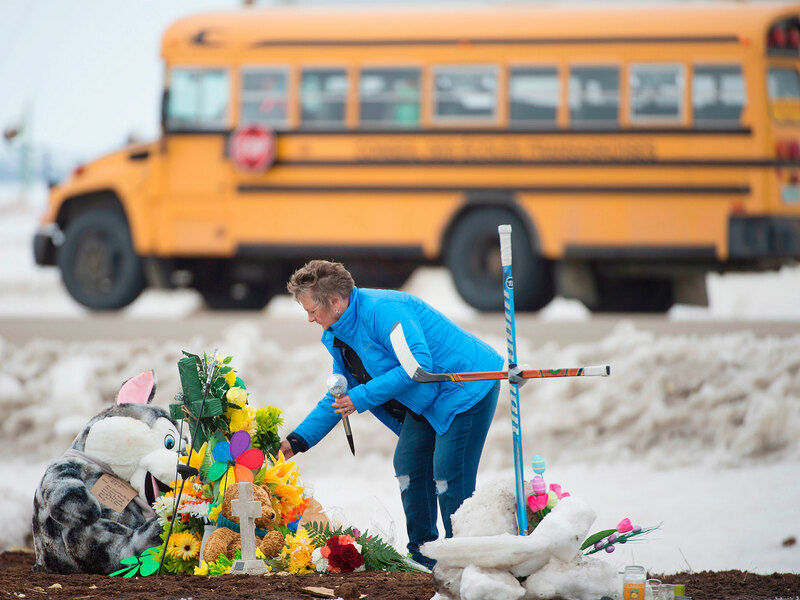 Everyone who has ever put their child on a bus to a game or a school or a museum and worried about bus drivers and other drivers and popped tires or potholed roads could relate to the tragedy in Humboldt. That was especially true in Canada but even more so in Saskatchewan, a province of 1.1 million people spread across some 22,900 square miles. 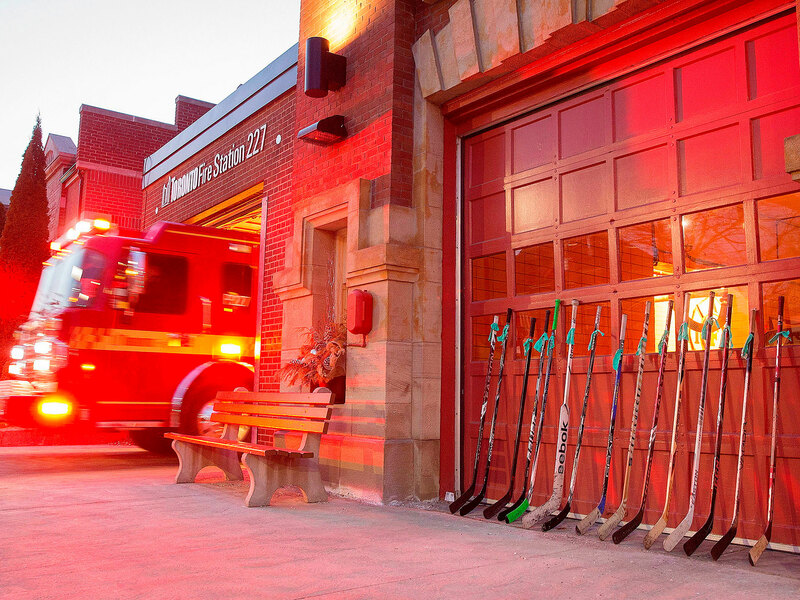 Most boys there play hockey, and all hockey players go on road games, arriving in rival towns by . . . bus. In snowstorms, at night, on two-lane highways marked with deer crossing signs and shrouded in fog, these were both rides and rites of passage. Glen Gulutzan, the Calgary Flames coach who visited the Humboldt survivors in the hospital, says he found serenity on those roads; now that he flies, he misses them. He didn’t see danger there. Instead, he sometimes preferred his teams take those trips early in their seasons, so they could bond more quickly. Tragedies were rare but not forgotten. The most infamous took place in 1986, when a team from Swift Current, Sask., also nicknamed the Broncos, was traveling to Regina, and its bus hit black ice and skidded off the road. Four players died, including center Scott Kruger, whose brother, a goalie named Trevor, survived the crash. Trevor can still recall the accident in all its horrific detail: the bus swerving off the road, flipping in the air, the jarring force of the impact. If he didn’t have children of his own now, he says he would never drive at night, or in bad weather, or on one of those two-lane highways that crisscross spacious, spread out Saskatchewan. “God willing, I hit the jackpot one day and move somewhere there’s no winter,” he says. As news of the Humboldt crash spread that Friday, families across the province thought of their own children, on their own buses, headed to games just like the boys from Humboldt. 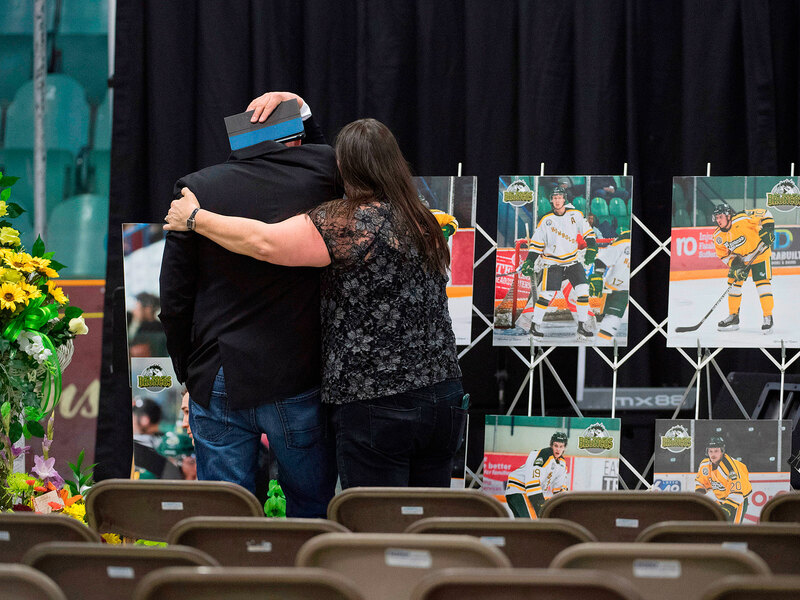 On Sunday, 48 hours after the crash, the citizens of Humboldt mourned the dead. They held a vigil at the only place that felt appropriate, the Elgar Petersen Arena, where thousands gathered. They spilled into the aisles when all the seats were filled, and then into the nearby curling club, convention center and gymnasium when the rink ran out of room. There were therapy dogs and crisis counselors and boxes of tissues that were passed down the aisles like collection plates. Flowers ringed the team logo at center ice, and there were cards and signs that displayed the number for a 24-hour crisis hotline. In front of the stage, pictures of the deceased stood over floral arrangements and stuffed teddy bears. One of the survivors, Nick Shumlanski, was in attendance, albeit with broken bones in his back and a bruise under his left eye. His parents happened to live less than a mile from the crash site, and he had called them from the bus, panicked, screaming into the phone. Doctors told them it was a miracle he had survived. 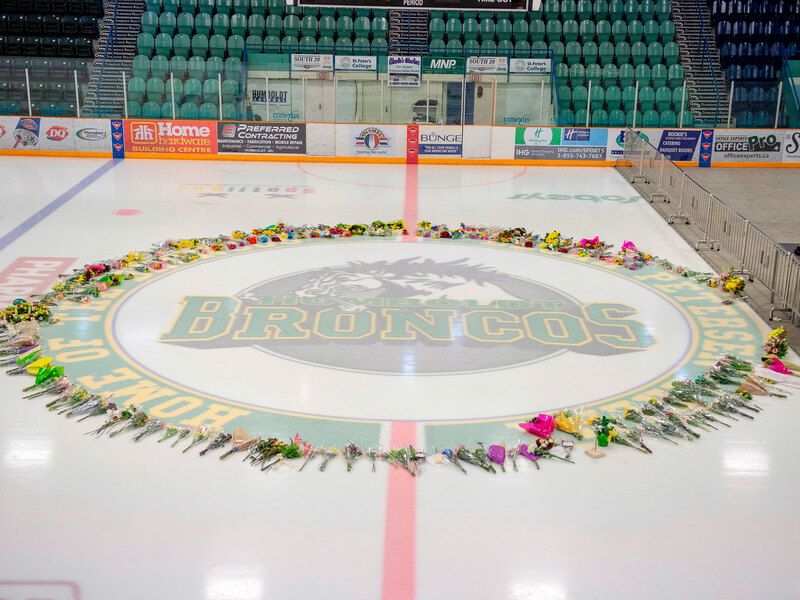 The vigil started around 7:30 p.m., and it was not lost on the attendees that had Humboldt won Game 5, the Broncos would have been playing in Game 6 right there, right then. The assembled sang O Canada, then Amazing Grace. Prime Minister Justin Trudeau told those gathered about his brother, Michael, who had died at age 23 in an avalanche in 1998, and how deeply that had shaken his parents. After the crash, it’s like that for everyone in Humboldt, a small city of roughly 6,000 that once claimed to be the mustard capital of the world. The farmers grow rapeseed, flaxseed, barley and wheat there now. But what Humboldt is really known for is hockey. There’s a street named after Glenn Hall, the homegrown goalie who played for three teams, won two Stanley Cups and was named one of the 100 greatest players in NHL history. A display noting the accomplishments of Mr. Goalie, which sits next to exhibits for other NHL players from the area, greets drivers as they reach the city limits. Humboldt plays Junior A hockey, a high-but-not-that-high level where there’s still recruiting and a draft, but the players range in age from 16 to 21 and are not paid. The very best will reach the major junior leagues, with a shot to make the NHL. But the majority instead seek a college scholarship. Locals are more like boosters than casual fans. Other than three salaried coaches and a paid office manager, everyone else who works for or around the team, from ushers to statisticians to ticket takers, are volunteers. To augment the $700,000 budget, they’ll run raffles where the prize is a new combine harvester. One group of local farmers even set aside 160 acres of land, and pledged the profits from the grain they grow there to the team. After Haugan took over in 2015, he told assistants he had the best junior hockey job in Canada. He still changed much of the operations. He started in the dressing room, where he wanted the players to respect the history of a team that was founded in 1947 and had won national titles in ’03 and ’08. He painted the dressing room so that the Broncos changed in green locker stalls, outlined in gold. Players had to take off their shoes before they entered and were reminded of the coach’s core values—consistency, commitment, stay hungry/be humble—because he hung the words on the walls. Small changes led to big ones. Humboldt went from 11th (of 12 teams) to fifth (and in the playoffs) in his first season. Haugan seemed to appreciate this group in particular. There was the captain Schatz, one of his first signees, the kid with the most infectious laugh and the league’s player of the month in February. And Logan Boulet, a defenseman who struggled in his first season but came back in the best shape of his life last fall. Both died in the accident. Boulet had signed up to become an organ donor on his 21st birthday, and his organs went to six people. Seeing that in the news, more than 450 locals became donors last week alone. While the TSN broadcaster Brian Munz watched the vigil on Sunday night, his friend sent him a photo. The friend had balanced a hockey stick outside his front door. “Leaving it out on the porch tonight,” the friend wrote. “The boys might need it . . . wherever they are.” A Humboldt native and former team broadcaster who once rode on those buses, Munz placed a stick outside his condo in Winnipeg, then tweeted out what his friend had sent. He could never have imagined what happened next. Got this text from a friend who I went to high school with in Humboldt. Similar outpouring continued unabated. A Humboldt resident set up a GoFundMe campaign, and by Wednesday, the total for victims’ families had climbed to more than $8.5 million, making that campaign the largest in the history of Canada and the third-highest ever. More than 100,000 people, from at least 65 countries, had chipped in. Schools in Humboldt reopened Tuesday, with extra counselors on hand. One survivor, Tyler Smith, nursing a broken collarbone and shoulder blade, had his breathing tube removed. Another, Ryan Straschnitzki, was paralyzed from the waist down but vowed to take up sledge hockey and make the Canadian Paralympic team. A good Samaritan had laid fifteen white crosses in front of Brandow’s church. He planted them right outside the front door—near a hockey stick. Meanwhile, outside the arena, roughly 15 cars sat parked, with white roses resting on their windshields. These cars belonged to the people who had died on the way to Nipawin, who had left them there on Friday morning. No one had picked them up. On Thursday, Dayna Brons, the team’s athletic therapist and the only woman on the bus, died in the hospital from the injuries she suffered in the crash. The total increased to 16 dead. Brandow needed another cross. For the moment, Humboldt’s mayor says, the city will focus on healing and memorializing and moving toward more normal lives. They’ve received help from nearby major cities, Saskatoon and Regina, which sent employees to sift through all the messages, to see who offered what and how they might be able to maximize the support, rather than lose or repeat donations in the midst of the overwhelming response they have received. What Muench wants, what they all want, is to not be another city defined only by the worst thing that ever happened to the people there. He wants Humboldt to be known not just for the crash, but for how the community responded to it. The drive from Humboldt to Nipawin takes about two hours, and it’s spent on that same straight-line, two-lane highway the Broncos’ bus had taken. Motorists can go half an hour without seeing another house, let alone another car. For two vehicles to travel two different highways and arrive at the same dangerous intersection at the exact same moment on a random Friday . . . . Well, what are the chances? Almost a week after the crash, a memorial remains where the bus had finally slid to a stop. The debris had been cleared, all the peat moss, the bus parts, the torn roof, the blood stains, the scattered clothes and spilled equipment, even the broken DVD of the movie Slap Shot that was found lying in the mud. 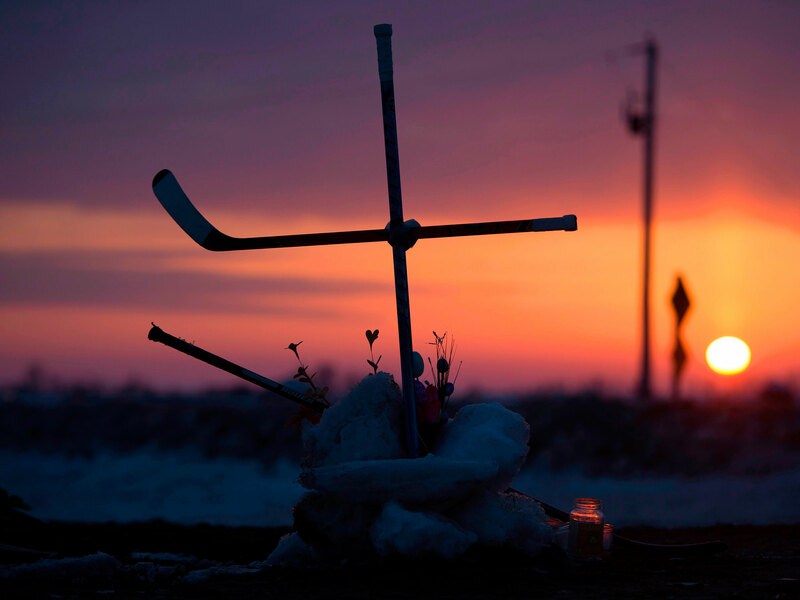 A black mat has been laid down, a memorial created, and Canadians had driven from all over the province to leave flowers and candles and stuffed bears and stickers and coffee cups and wreaths and enough hockey sticks to outfit an entire league. As the clock ticks toward 5 p.m., about the time the crash happened, two police officers lay a remembrance plaque between bouquets. A man stands off the side, crying. TV reporters prepare for another stand-up. A woman approaches with three children, two boys and one girl. The kids place pinwheels and flowers amongst other pinwheels and flowers. “I think I can see the marks from the bus,” the daughter says. “You can see the skid marks a little bit,” her mom responds. “Can we go home now?” the daughter asks. “It’s not that easy,” the mom says, and then she starts on about that fateful Friday. How they had planned to attend the game and how this was Nipawin’s year and her daughter was to participate in a flag presentation. Then she starts to break down and turns toward her car, walking away, sobbing. Here was the painful reality that hit small towns that dot the interior of Saskatchewan. An unprecedented response to an unspeakable tragedy and the fact that one doesn’t exist without the other.